Opening Day is HUGE in Cincinnati, hometown of author Louise Borden. 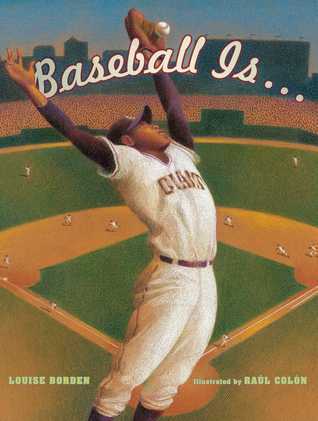 And Baseball Is… is the perfect book to welcome back the boys of summer. It’s a gorgeous day to take in a ballgame, some peanuts and cracker jacks, and an out-of-the-park book. I’m adding a little something from youtube of the great John Fogerty’s Centerfield “Put Me In, Coach” with retro videos! Enjoy! This weekend I had the fortunate opportunity to meet Louise Borden, Cincinnati author of several children’s books. We had a wonderful chat about her research and writing. I am so lucky to have met her. She is an amazing author and I am sure you will love this book as much as I do. Louise Borden writes this biography with passion for the Reys, German born Jews, who are caught in the mass exodus of Paris in 1940. Her words allow even the youngest readers (appropriate for ages 8+) to feel the sense of urgency as the German army marches closer and closer to Paris, how many neighbors thought that Hans and Margaret might have been German spies, and how they had to gather all the necessary papers, visas, passports, tickets, and money for their exodus. 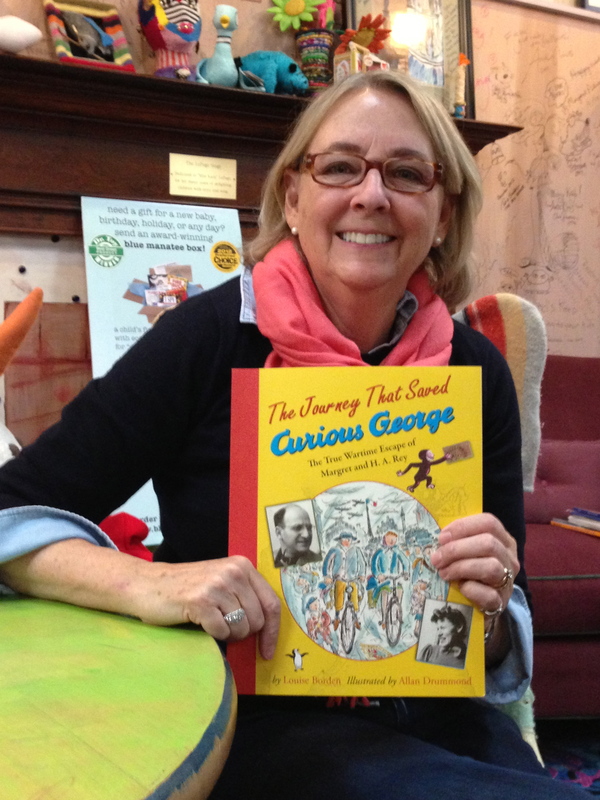 Through it all, she keeps the link to Curious George visible to the reader. She describes how the Reys carried their manuscript and illustrations with them, even though they could carry very little with them as they biked and took trains through France, Spain, and Portugal. She demonstrates how the Reys often escaped capture by simply showing officials the story and illustrations that would eventually become the first Curious George book. Allan Drummond illustrates this story precisely. Every detail is captured in his illustrations. He too, stays true to the story of Curious George being sure to include images of the yellow hat, the pipe, and of course George. Scattered among the detailed illustrations are photos take by Hans and Margaret Rey, copies of letters to and from editors, and Hans Reys personal diary/expense log. 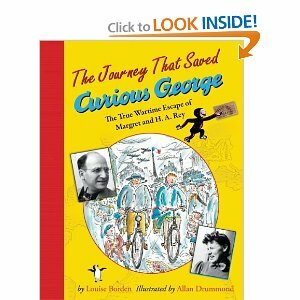 This is definitely a must-read for anyone who knows and loves Curious George, but especially for children (and adults) learning about World War II, the German occupation of France, and the exodus of thousands of Jewish citizens. For more information about Louise Borden and Allan Drummond visit their websites. Have you ever been so preoccupied that you walked out of a store without paying? I have. I did. Today! 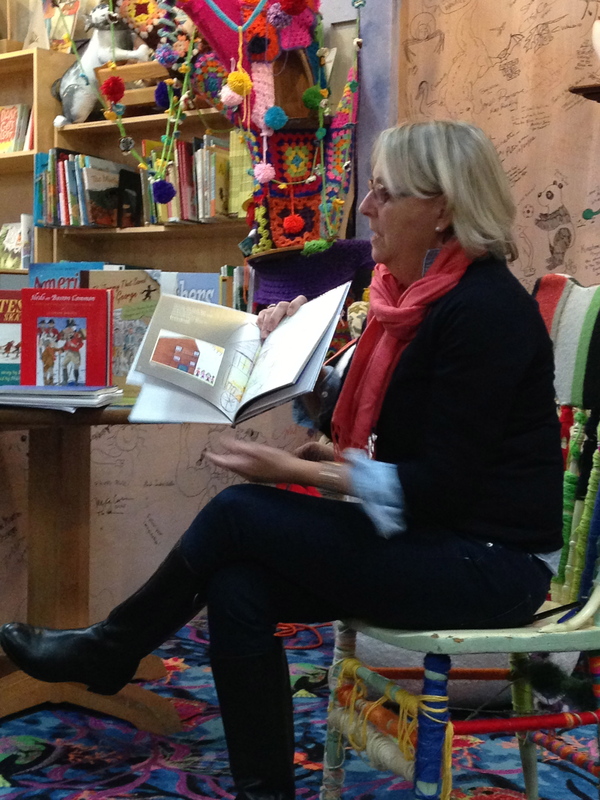 I was in my favorite children’s book store, The Blue Manatee, in Cincinnati laughing and talking with old and new friends. One of the employees is a teacher I used to work with, and who works there part time. Every time I visit on a Saturday we hug and catch up with each other’s news. 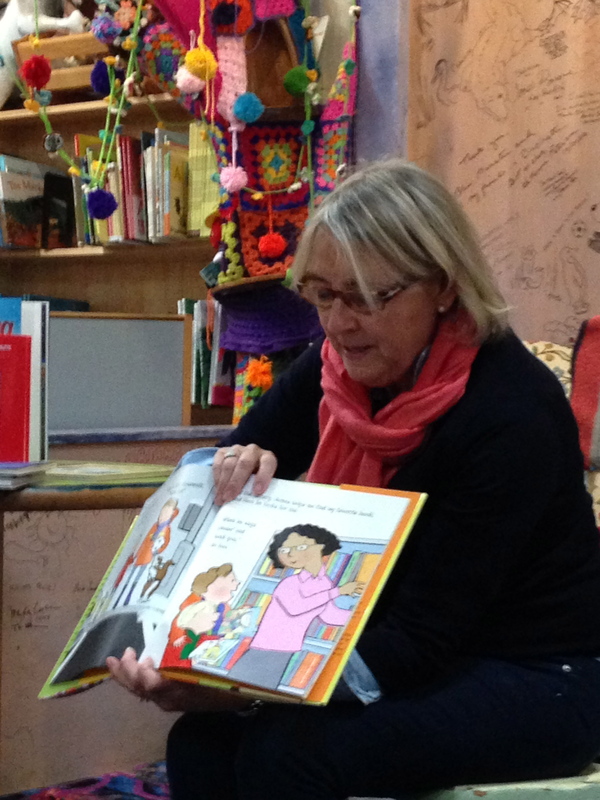 And today was extra special because I got a chance to meet a children’s author. 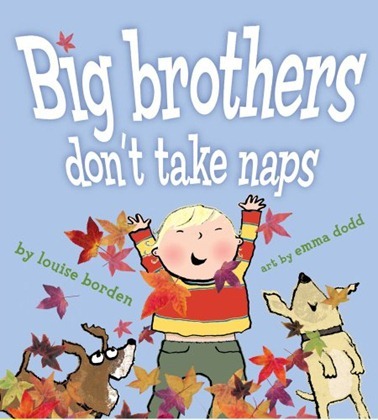 Louise Borden, is a native Cincinnatian who has written several books for children and young adults. She read from some of her books and talked to the kids and parents in attendance. I picked up a picture book, Big Brothers Don’t Take Naps and her new non-fiction The Journey That Saved Curious George: The True Wartime Escape of Margret and H. A. Rey. She graciously signed both copies and we talked for a long time. I was fascinated with her story as an author. I also learned that we have a lot in common, having been and lived in many of the same cities around the world. We chatted for so long, that when I walked out of the store, autographed books in hand, I was in a happy fog and simply left without paying! I didn’t realize my mistake until I got home and started showing my husband my new purchases… uh, are they called purchases if you don’t purchase them? Yikes! I called the store right away, explained what had happened and gave them my credit card number over the phone. Whew! Yes, these are my new purchases!